The Congregational Life Ministry has responsibility for planning, coordinating and monitoring the church’s process of welcoming visitors, encouraging newcomers toward membership, and developing events or media that strengthen the fellowship and communication within the congregation and make the church known to the Lexington area. Foster good communication within the congregation and the presentation of Beaumont Presbyterian Church to the larger community. The coffee is freshly brewed and steaming hot, and the snack tables are full every Sunday at Beaumont immediately following worship. Late Sunday mornings are special times at Beaumont — time to chat with friends about the week past and the week ahead, give kudos to the choir members who linger among us, and talk with the pastor if you want to discuss some points in the sermon. It’s a time of fellowship, a time that we cherish in our church family. The Easter breakfast crew hard at work. About four times each year we put out the call for the tasty dishes served up by our members. These potlucks are well-attended and add another dimension to our life together. In addition, breakfast is sometimes cooked up and served on special occasions, such as Easter and Rally Sunday. 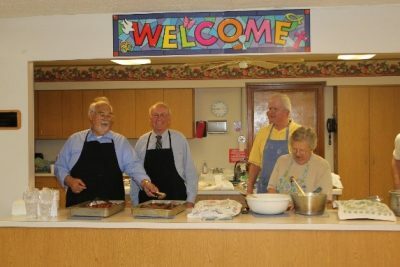 The Congregational Life Ministry also has responsibility for working with the pastors to plan and carry out ministries of spiritual, emotional and physical care within the congregation. Caring for each other through prayer and service is a vital part of our calling at Beaumont. We are called by Christ to become the church, each of us members of the body of Christ. And so we witness to the love that we so generously are given by responding to the needs of those among us. Whether as an act of intercessory prayer by our Prayer Team, a visit by a homebound member, or a meal lovingly prepared by our Meal Ministry, we attempt to serve as the hands and feet of Christ. Please read below for more information about these programs. We believe that Jesus is the Alpha and Omega — the beginning and the end — in our intercessions; he is at work from the moment we bow our heads or lift our arms until we “Amen!” He knocks at the door of our hearts with someone’s need, and then gives us a desire to open that door. He speaks words of guidance about what to pray and then enables us to hear his voice. He calls us to pray and imparts the grace to join him in our prayers. When we offer up our request, it is his power that secures the answer. The Beaumont Prayer team members are dedicated to offering up praises and prayers on behalf of each other, the congregation and staff, friends and families, country and world at large, addressing the requests and concerns that have been made known to them. If you are interested in joining the special spiritual group, in participating in experiencing God’s presence in our midst, in seeking God’s will in our lives; and engaging in the sacred joy of praying for others, please call the church office, 859-278-5062. Beaumont is committed to an ongoing home bound ministry as our way of sharing Christ’s love with the members of our church family who are unable to come to church for worship and fellowship. Members of this ministry visit various home bound members and their families monthly and the church office seeks to keep these members involved with weekly mailings as well as a monthly mailing of the newsletter and various devotionals throughout the year. Our meal program is a ministry designed to be a blessing for both the recipient and the giver! We want to reach out to our church family in times of need, both joyful and sorrowful times. Whether celebrating the birth of a baby, bereaving the loss of a loved one, recovering from surgery, or providing care for someone else, our members often find times when they can use a little extra help. That’s where meals provided by our teams come in. The ministry provides us with the opportunity to be a blessing and to be blessed.